Heroes from Chinese military fiction are often cast as reincarnations of celestial beings. 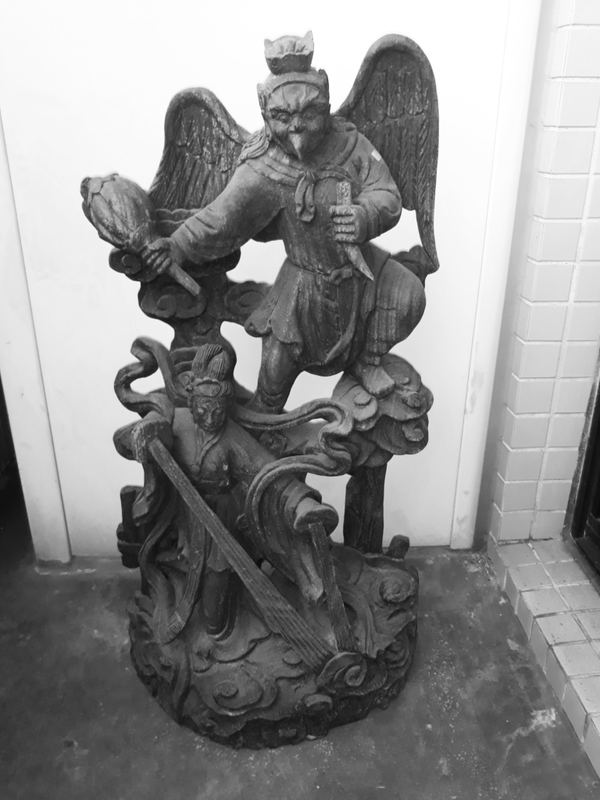 For instance, the famous patriot General Yue Fei (岳飛, 1103–1141) is portrayed as a reincarnation of the Hindu-Buddhist bird deity Garuda (Jialouluo, 伽樓羅; Jialiuluo, 伽留羅) in his folk biography The Story of Yue Fei (Shuo Yue quan zhuan, 說岳全傳, 1684). The bird, called the “Great Roc, the Golden-Winged King of Illumination” (Dapeng jinchi mingwang, 大鵬金翅明王), sits at the head of the Buddha’s throne in the Western Paradise. His fiery temper is aroused when a bat-spirit (the embodiment of the Aquarius constellation) passes gas during the Enlightened One’s sermon on the Lotus Sutra. He swoops down from the throne and snatches her up in his beak, killing her instantly. The Buddha admonishes the bird for his transgression of Buddhist law and exiles him to earth. His rebirth in the human world actually serves to counterbalance the actions of a nomadic antagonist, originally a dragon sent from the Eastern Heaven to punish China (Qian, 2016). 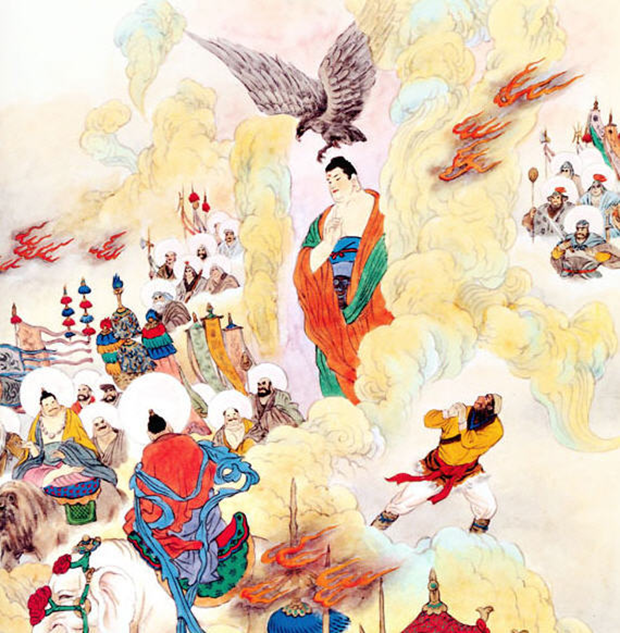 This storyline was influenced by a previous work, Journey to the West (Xiyouji, 西遊記, 1592), which explains how Garuda came to hold such an important position above the Buddha. The fact that this literary motif appears in two famous Chinese classics points to some widely known religious concept circulating during the 16th– and 17th-centuries. In this paper I will trace the origins of the motif from ancient South Asian literature and religious architecture to Esoteric Buddhist art in East Asia. The path we walk is a complicated one spanning centuries, belief systems, and artistic mediums. Fig. 1 – A modern depiction of the Roc demon in his humanoid form (artist unknown) (larger version). Fig. 2 – A modern depiction of the roc trapped above the Buddha’s head (artist unknown) (larger version). The origin of the Chinese literary motif is over two thousand years old, first appearing in the 4th-century BCE Hindu epic the Mahabharata. The holy work states that Garuda is the son of the creator-sage Kashyapa and his second wife Vinata. After gestating in his egg for one thousand years, the bird bursts forth and his massive, fiery body grows to engulf the entire cosmos. His sun-like splendor is so bright that the devas mistake him for Agni, the god of holy fire. Garuda is forced to reduce his size and illumination when the devas ask him to do so out of fear. Falling prey to an ancient curse, his mother Vinata loses a bet and is enslaved by her sister Kadru, mother of the naga-serpents. Garuda agrees to steal the vessel containing the immortal elixir of amrita from the devas in order to secure his mother’s release. He uses his great strength and speed to defeat the celestial army and kill the serpents guarding the elixir, and he uses his powers of transformation to extinguish the fire surrounding the treasured substance and sneak past the magic discus charged with dismembering thieves. Upon his return trip, Garuda is halted by the supreme deva Vishnu who grants him the boon of immortality for partaking in such a difficult quest. In return, the bird grants him the boon of serving as the carrier of his celestial vehicle (vimana) and positions himself above Vishnu’s head atop the flagpole (dhvaja). Not long after, Indra, king of the devas, strikes the bird with a lightning bolt in an attempt to retrieve the amrita. The bird pays him respect by shedding a single feather and grants him the boon of eternal friendship. After learning the reason for the theft, the devaraja grants Garuda the boon of taking his enemies the nagas as his food. Both of them then orchestrate a plan in which the bird pays the amrita ransom to free his mother, but Indra takes the elixir away before the serpents can drink of it. Finally, Garuda slaughters all of the nagas (Ganguli, 2003, pp. 57-82). It’s easy to discern several aspects from Chinese fiction in the ancient story: 1) a powerful golden bird with great strength, speed, and powers of transformation; 2) a vessel with magical properties; 3) conflict between the bird and heavenly forces; 4) his subjugation by a higher power; 5) his installment above a deva’s head; and 6) continued conflict between the bird and his serpent foes. This adds to existing literature showing that the Mahabharata influenced Journey to the West (Subbaraman, 2002). Since the Mahabharata was published, Garuda has been depicted on a number of ritual flagpoles (dvaja) in India. The dvaja pillar “is placed opposite the entrance to the main shrine [of a Hindu temple], on axis with the central image…it is an object of great importance and worship” (Dallapiccola, 2002, p. 60). Adherents would have paid reverence to it before entering the temple. People affected by snake bites would often embrace these types of pillars because they believed Garuda’s powers over the nagas (and their serpentine kin) would neutralize the poison (Zimmer, 1946, p. 75). The oldest of the stone dvaja columns still standing is the Heliodorus pillar (2nd-cent. BCE) erected by a Bactrian-Greek envoy and convert of that name in honor of Vishnu in Vidisha (fig. 3) (Walker, 1968, p. 246). The Garuda is no longer extant, having been eroded by time or destroyed by iconoclasts. It is considered the “first dated monument linked with Vishnu” (Elgood, 2000, p. 56). Clues to what the original capital may have looked like can be drawn from numismatic evidence. 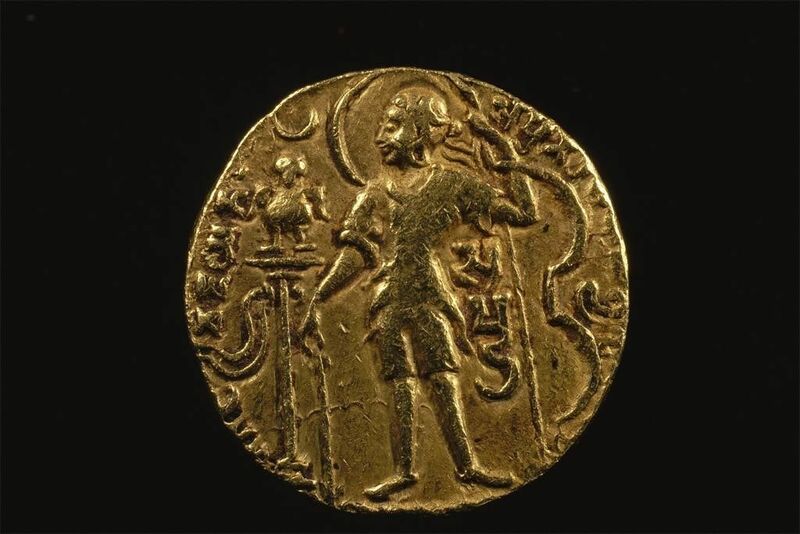 The golden dinar of King Samudra (r. 335-375 CE) of the Gupta Empire, for example, features a Garuda dvaja (fig. 4) (Mookerji, 1973, p. 52). The capital is depicted as a bird, suggesting the eroded figure on the Heliodorus pillar may have originally taken such a form. This differs from later humanoid depictions of the god (see below). Fig. 3 – The Heliodorus pillar (2nd-cent. BCE), Vidisha, Madhya Pradesh, India (larger version). The Garuda capital is missing. Photo by the American Institute of Indian Studies (AIIS). Fig. 4 – The gold dinar of King Samudra (r. 335-375) of the Gupta Empire (larger version). The Garuda dvaja can be seen to the left. Photo by the American Council for Southern Asian Art (ACSAA). Garuda’s association with Buddhism seems to be quite old. His appearance on a number of standing gateways and carved cave temple entrances, collectively known as toranas, from the 1st-century BCE onward points to him being absorbed into the religion’s pantheon within a few centuries of the historical Buddha’s death. 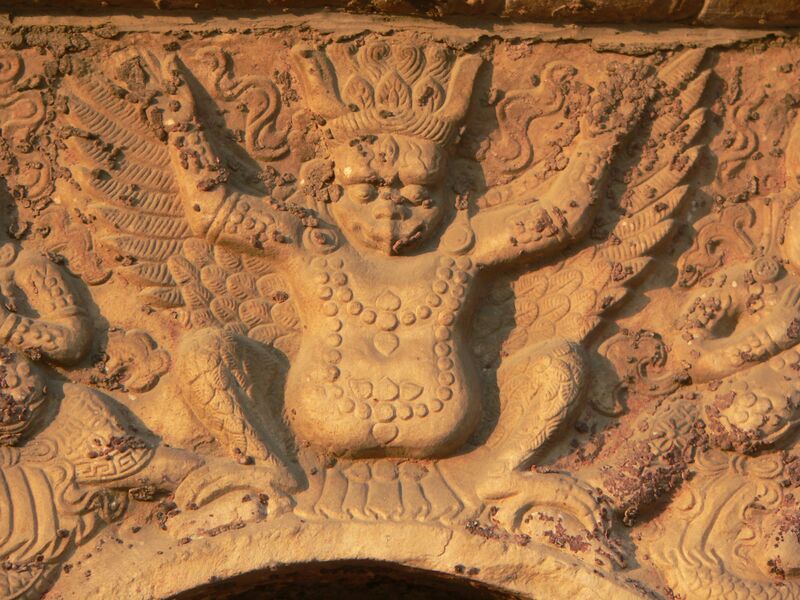 The oldest extant representation of Garuda appears on the eastern gateway of the Great Stupa at Sanchi (fig. 5) (Iyer, 1977, p. 52). 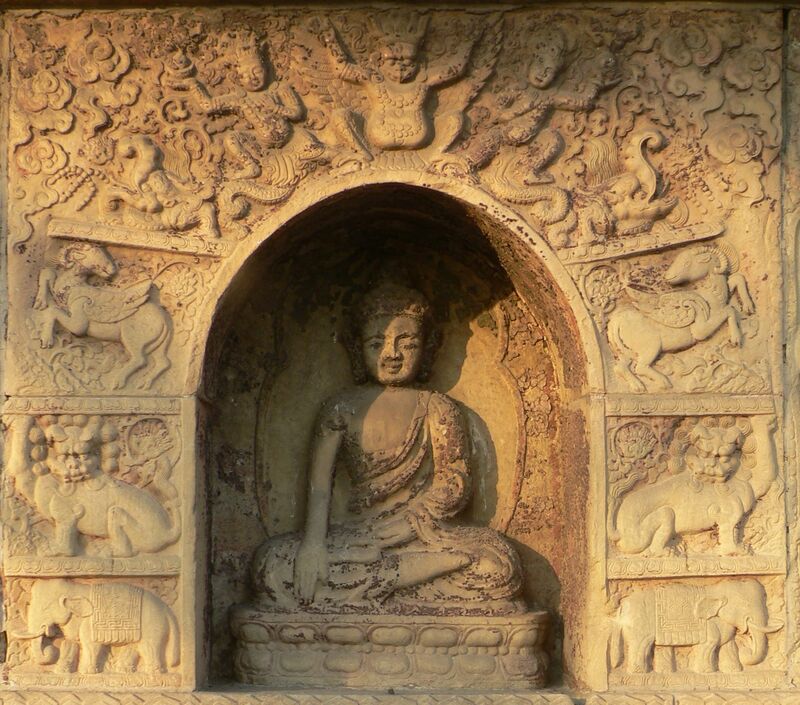 Dated to the 1st-century BCE, the standing torana has three tiered architraves, the middle of which portrays a bodhi tree, an iconoclastic representation of the Buddha, flanked by real and mythical creatures paying homage to it. 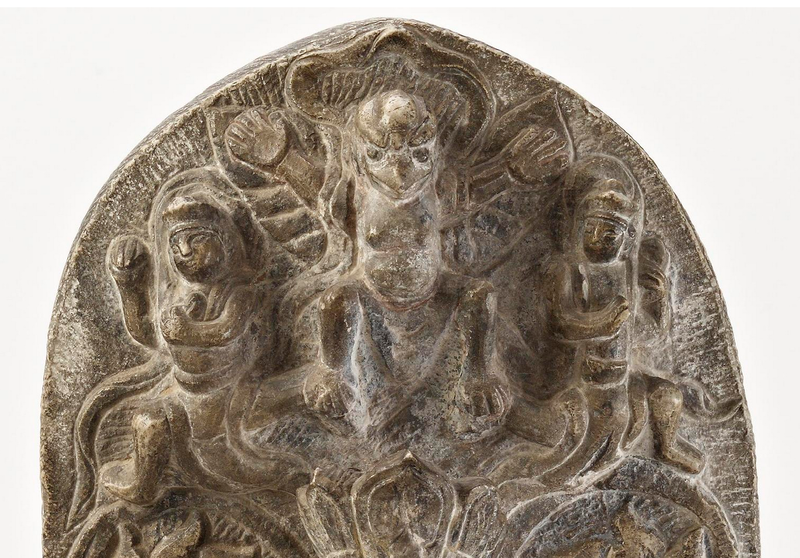 The far right side of this stone relief features Garuda standing next to a five-headed king of serpents (nagaraja) (fig. 6). The bird is depicted as a husky parrot with a delicate, forward curling crest, a thick beak, a pierced human ear, small flapping wings, and lacey tail plumage. The relationship between the two is amicable since it is a scene of religious reverence. This “Garuda and serpent” motif appears on the partial remains of a slightly younger stone architrave discovered in Kankali Tila at Mathura (Smith, 1969, p. 28). The circa 1st-century BCE relief depicts him as a large bird of prey with similar iconography, including the curling crest, thick beak, and pierced human ear. But the tail plumage is far more flowery and ornate, indicating that the artist built off of the earlier example. Also, unlike the architrave from the Sanchi stupa, this piece portrays Garuda locked in a tense standoff with a three-headed nagaraja; the bird has a firm grasp of the hissing serpent with his beak, but the foe’s body is wrapped twice around the god’s neck and the tail is anchored at the base of a nearby tree (fig. 7) (Vogal, 1972, p. 172). Fig. 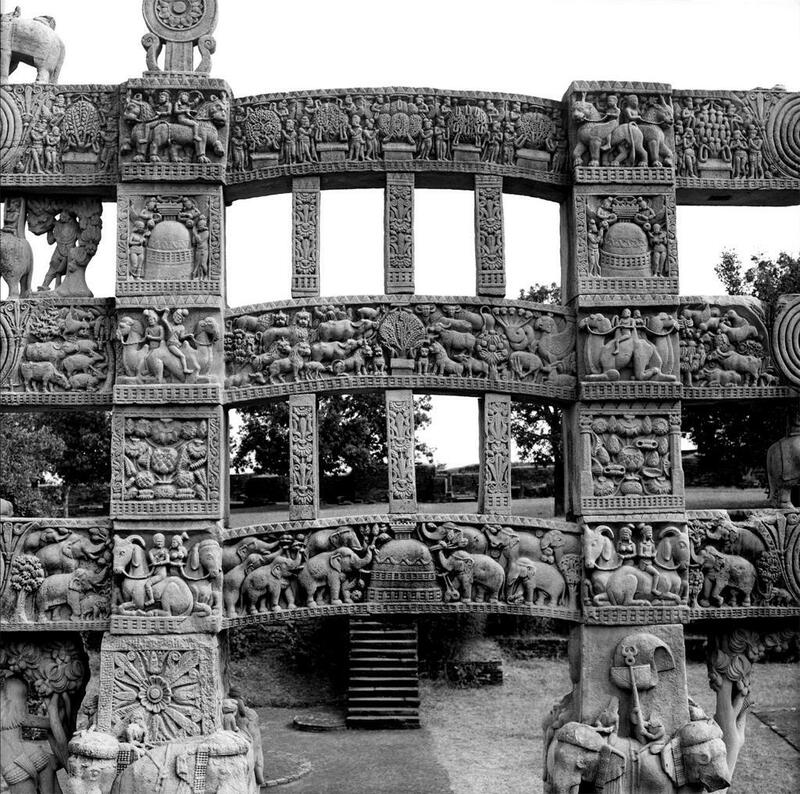 5 – The reverse side of the East Torana of the Great Stupa at Sanchi (1st-cent. BCE), Madhya Pradesh, India (larger version). The Garuda and serpent motif is visible on the right side of the central architrave. Fig. 6 – Detail of the Garuda and serpent motif (larger version). Photos by the The Huntington Archive of Buddhist and Related Art (HABRA), The Ohio State University. Fig. 7 – The partial architrave discovered in Kankali Tila (c. 1st-cent. BCE) in Mathura, Uttar Pradesh, India (larger version). Drawing from Smith, 1969, p. 28 . Later depictions of the motif anthropomorphize Garuda. For instance, he makes an appearance standing over the torana of the carved Bhuta Lena cave shrine number forty (c. 100 CE) in Junnar (fig. 8) (Qureshi, 2010, p. 315). He is coupled with a nagaraja at the apex of the arched doorway; the two are presented as peaceful humanoid companions wearing matching hats and clothing and standing in a similar pose. This could be related to a birth tale (jataka) in which the Buddha, in his previous life as a hermit, reconciles the hatred between Garuda and a naga by “rehears[ing] the blessings of loving kindness until they [are] both at one. Thenceforward they abode together happily in peace and harmony” (Vogal, 1972, p. 142). Fig. 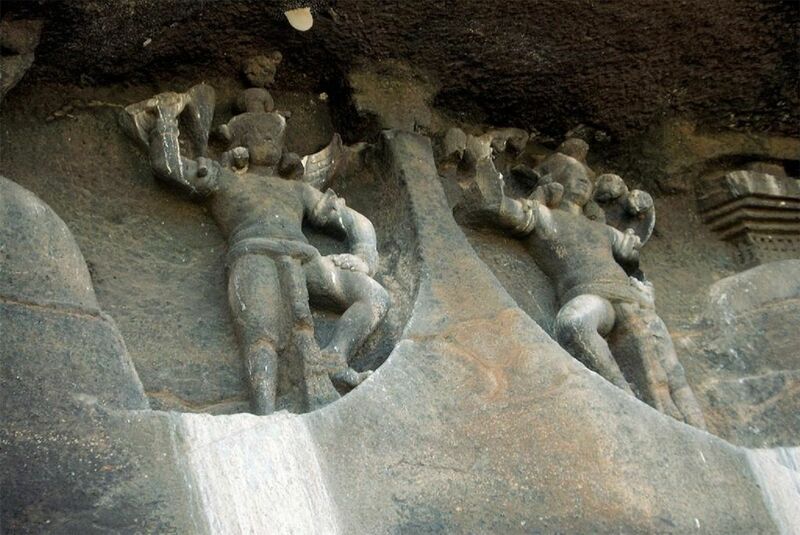 8 – Garuda (left) and Nataraja (right) above the torana entrance of the Bhuta Lena cave shrine no. 40 (c. 100 CE) in Junnar, Maharashtra, India (larger version). Photo by ACSAA. Dhar (2009) notes that the standing gateway toranas were replaced in popularity by “the post, lintel, and eave-cornice (kapotapālikā) type entryways” sometime after the 2nd to 3rd-century CE (p. 16). She continues, “From the fifth century, such an entrance gateway became an integral part of temple doorframes…its posts served as pilaster-doorjambs (stamhaśākhās) and the eave-cornice integrated with the lintel” (p. 16). It was around this time that Hindus followed the example of their Buddhist neighbors and began to create carved religious structures (Dehejia, 1997, p. 124). Such temples were considered the home of a given deity when they left their heavenly abode (Dehejia, 1997, p. 141). As such, these temples were profusely decorated with images of the deva, including the entrance way, to aid in their worship. A related root word for torana “suggests its role as an architectural symbol of a rite of passage or liminality” (Dhar, 2009, p. 1). This means whoever steps into the world of the “other” does so under the watchful eye of the deity placed on the torana. In the case of temples devoted to Vishnu and lesser devas associated with him, the image is either Garuda by himself (being a symbol of the god) or bearing the deva on his back, a variation on his portrayal in the Mahabharata that came to dominate his traditional iconography (Zimmer, 1946, p. 76). Whether alone or coupled with Vishnu, the antagonistic version of the Garuda and serpents motif began to appear on Hindu toranas by at least the 7th to 8th-century. In fact, the only examples that I can find come from this time period. 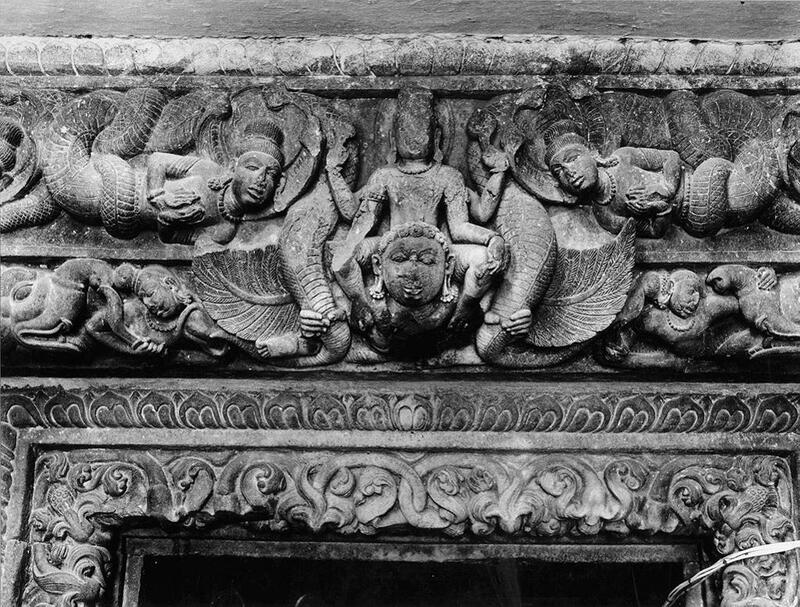 I have seen examples of the “Garuda and Vishnu” motif above entrance ways as late as the 11th-century, but these are missing the serpents. However, later Tibetan art featuring the serpent variation suggests there may be Indian examples that I am not aware of. The 7th-century example appears on the torana of the Gaudar Gudi Temple in Badami (Gupte, 1967, p. 54) (fig. 9). 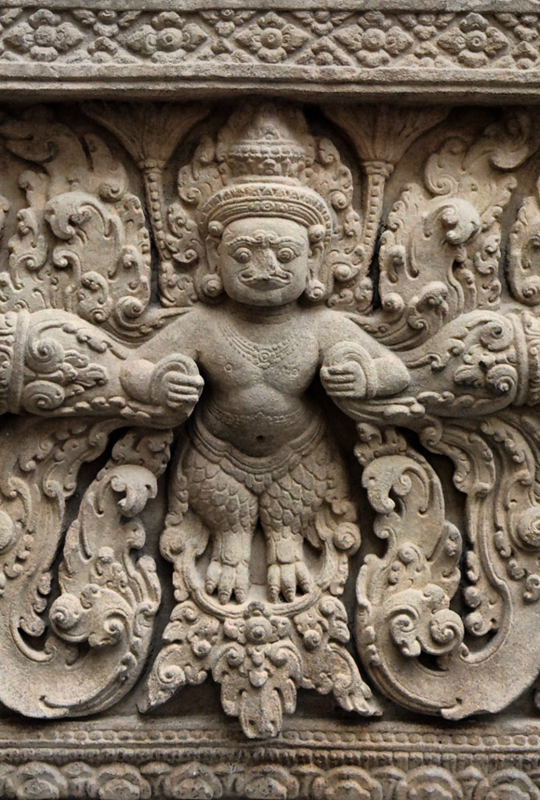 Garuda is portrayed in humanoid form wearing a hat and clothing similar to figure 8. He is squatting over the entrance while grasping the tails of naga-serpents flanking him on both sides. The first c. 700 example appears on the torana of the Durga (Fort) Temple in Aihole (fig. 10) (Tartakov, 1997, p. 192). He is depicted as a smiling human in an erect flying posture with his left leg tucked under his groin and his right trailing behind him. Just like the first piece, he is wearing similar attire and grasping the tails of nagas on his left and right sides. The second c. 700 example appears over the entranceway of the Rajivalocana Temple in Rajim (fig. 11) (Patel, 1992, p. 146). But this version has Garuda transporting a four armed Vishnu. The figure is again depicted in human form and grasping the tails of his serpentine foes. Fig. 9 – The Gaudar Gudi Temple Garuda with serpents (7th-cent. ), Aihole, Karnataka, India (larger version). Photo by AIIS. Fig. 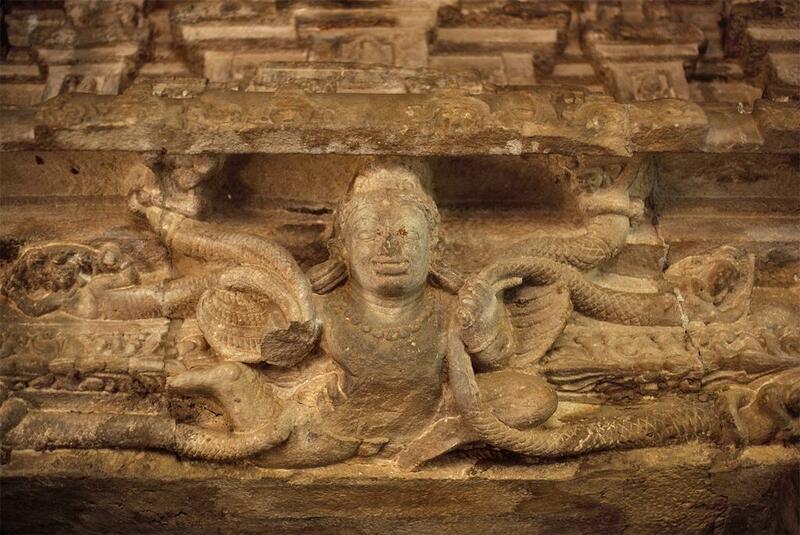 10 – The Durga (Fort) Temple Garuda with serpents (c. 700), Aihole, Karnataka, India (larger version). Photo by ACSAA. Fig. 11 – The Rajivalocana Temple Garuda and Vishnu with serpents (c. 700), Rajim, Chhattisgarh, India (larger version). Photo by the AIIS. The torana spread to Southeast Asia by the late 6th– or early 7th-century. Next to India, Cambodia has the largest number of and most diverse toranas in all of Asia (Dhar, 2009, p. 214). In fact, I would dare say this is where the Garuda and serpents motif reached the point of perfection. Parul Pandya Dhar’s wonderful monograph The Torana in Indian and Southeast Asian Architecture (2009) features two beautiful examples from Buddhist temples carved in the unmistakable Khmer style. The first is an exquisitely crafted 9th-century entranceway from the Prasat Kok Po Temple in Siem Reap (pp. 222 and 228) (fig. 12 and 13). It portrays Garuda as a large, stout man-bird with pierced ears and wearing a Cambodian headdress and garment. He is standing on a pedestal and bearing a four-armed Vishnu on his back while grasping the flower garland-like tail of a three-headed nagaraja in each hand. The god is further flanked by two large creatures with gaping mouths known as “Faces of Glory” (Kīrtimukha). Their arms interlock not only with the undulating serpents grasped by the man-bird, but two others located on the outermost left and right portion of the torana—the combination of arms and slithering serpentine bodies form a beautiful horizontal wave pattern with four crests. These larger nagarajas bear images of tiny Garudas standing on the back of their hoods. The author notes that the “Kīrtimukha and makaras seen on Indian and Indonesian toranas are often replaced by the garuḍa-nāgas combination in Cambodia” (Dhar, 2009, p. 228). The second is a mid-10th-century entranceway from the Prasat thom Temple in Koh Ker (fig. 14 and 15). The depiction of Garuda is identical to the first example down to the clothing. But instead of bearing Vishnu and cooperating with the Kirtimukha to conquer nagas, he alone is grasping the long, flowery tails of his enemies who are positioned on pedestals at the same level as his own. Two small Buddhas use the bodies of the tightly drawn serpents as a place to meditate. Both nagarajas bear the Wheel of Buddhist Law (Dharmachakra) on their chests. The composition is therefore symbolic of Garuda and the nagas working together to literal “support” Buddhism. Fig. 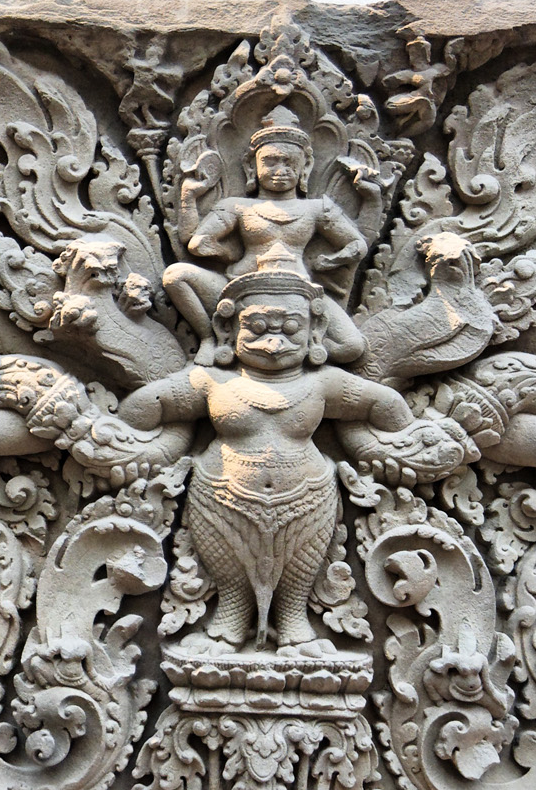 12 – The Prasat Kok Po Temple lintel featuring the Garuda and Vishnu with serpents motif (9th-cent. ), Siem Reap, Cambodia (larger version). Fig. 13 – A detail of the motif (larger version). Fig. 14 – The Prasat thom Temple lintel with the Garuda and serpents motif (mid-10th-cent. ), Preah Vihear, Cambodia (larger version). Fig. 15 – A detail of the motif (larger version). Photos by Wikimedia commons. The Buddhist examples from Cambodia appear to have been influenced by depictions of the Garuda and serpents motif from Hindu temples. This is because they depict Hindu deities like Vishnu and portray the bird and naga as (symbolic) enemies. The same can be said for Buddhist art and architecture in East Asia. 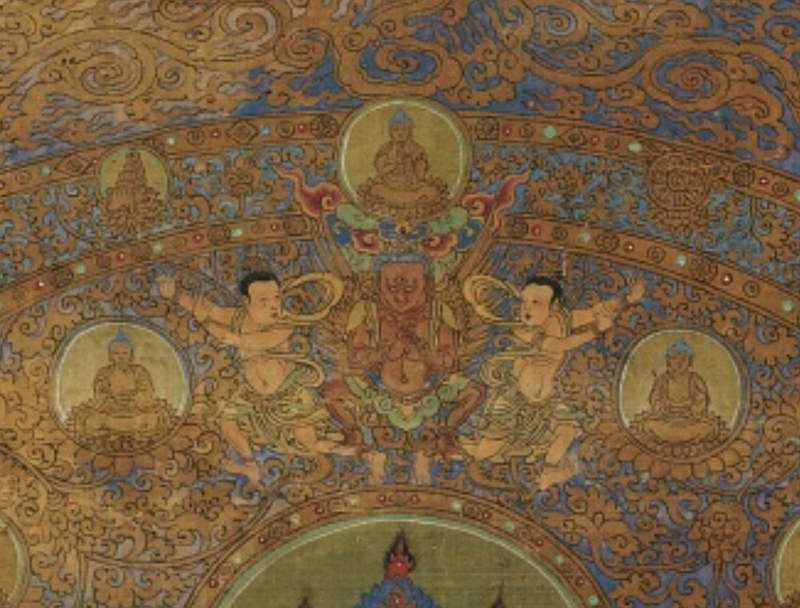 For instance, Heather Stoddard (1996) comments that the motif “is in fact present in all the main Tibetan [Buddhist] styles, and is indeed unique to Tibetan art” (p. 40). She continues, “The author has searched all over Asia, in Hindu or Buddhist cultures, without success, looking for the garuda in this pro-eminent position” (p. 40). (It’s obvious that Stoddard was unaware of the architectural origins of the motif at the time of her study.) One of the three pieces that she cites as examples is a 13th-century Nepalese painting of Ratnasambhava (Baosheng rulai, 寶生如來, fig. 16), one of the five Esoteric Buddhas (Stoddard, 1996, p. 42). 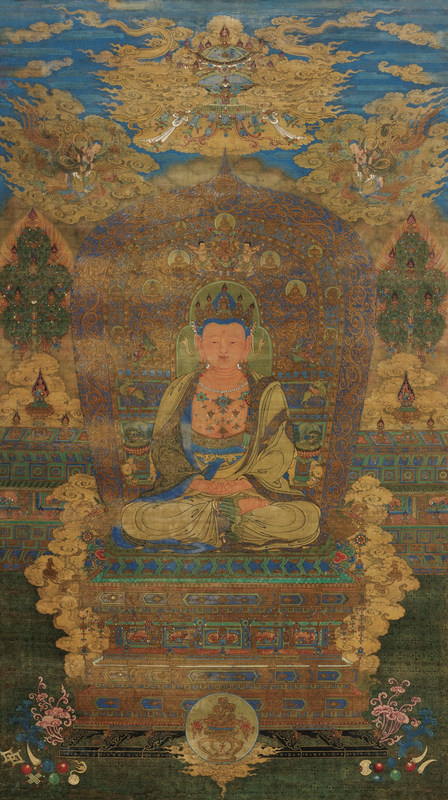 The painting shows the Buddha sitting on a throne comprised of a lotus flower base and a backrest framed by all sorts of real and mythical creatures. The Garuda and serpents motif crowns the apex of the throne. Art historians call this an “enlightenment torana” or a “gate of glory” (Beer, 1999, p. 88; Stoddard, 2008, p. 23). It’s clear that Buddhist artists came to equate the torana with the fiery halo that signifies a deity’s enlightened or divine nature. Robert Beer (1999) believes that these enlightenment toranas could have appeared as early as the 4th-century, but that it became a common fixture in Buddhist art from the 8th to the 12th-century (p. 90). 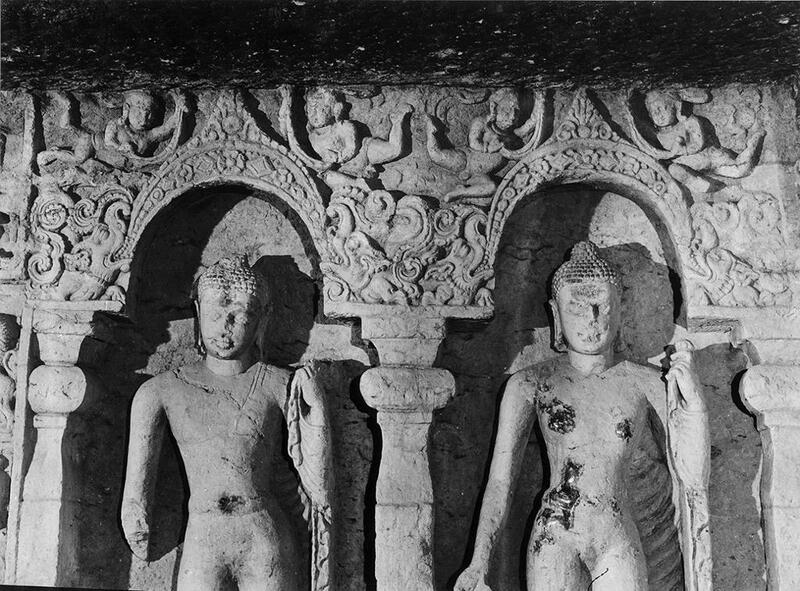 Two beautiful examples of an enlightenment torana from the mid-6th-century appear in the Kanheri Temple Cave number ninety in Mumbai (Malandra, 1993, p. 110). It depicts two Buddhas standing under their own gates of glory, complete with what appears to be licks of heavenly flame (fig. 17). Though missing the motif, these examples are nearly identical to later Tibetan art, suggesting, as mentioned above, that there could be later Indian examples featuring the Garuda and serpents motif that I am unaware of. Fig. 16 – Ratnasambhava, with Bodhisattvas (13th-cent. ), Nepal (larger version). The Garuda and serpent motif can be seen at the apex of the throne. Photo by the Los Angeles County Museum of Art. Fig. 17 – Two Buddhas with enlightenment toranas, from Kanheri Temple Cave number ninety, Mumbai, Maharashtra, India (mid-6th-cent.) (larger version). Photo by the AIIS. Within this international Buddhist community, the Tibetans stood apart by virtue of the particular zeal with which they sought to master the Indian Buddhist tradition. They had both the will and, since Tibet is relatively close to eastern India, the opportunity to observe closely and gradually absorbed the highly sophisticated traditions of Buddhism and Buddhist art that flourished in eastern India at this time” (p. 6). Tibetans living and traveling in India no doubt came into contact with architecture featuring the Garuda and serpents motif. 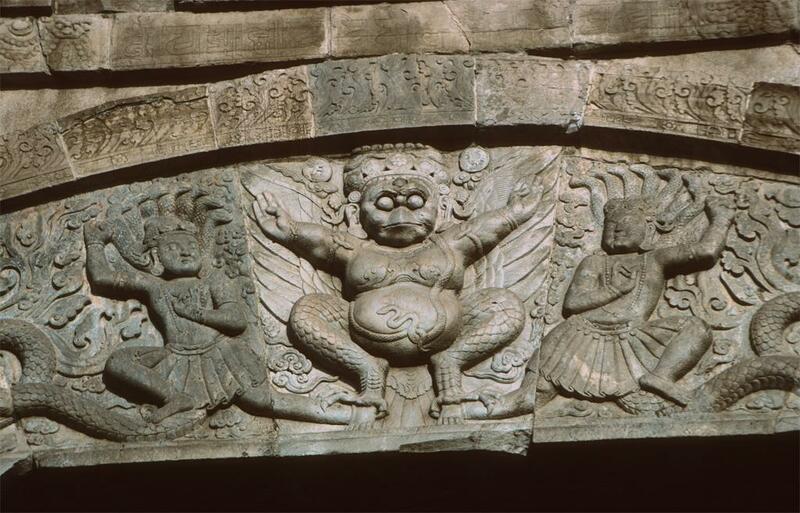 This is evidenced by their depiction of Garuda as a chubby man-bird (see fig. 22 below, for example). The Vishnudharmottara Purana (7th-century) contains a treatise on prescribed Hindu iconography that mentions the deity “should be made slightly pot-bellied and adorned by all ornaments” (Kramrisch, 1928, p. 80). Variations of the motif appeared as it spread eastward. 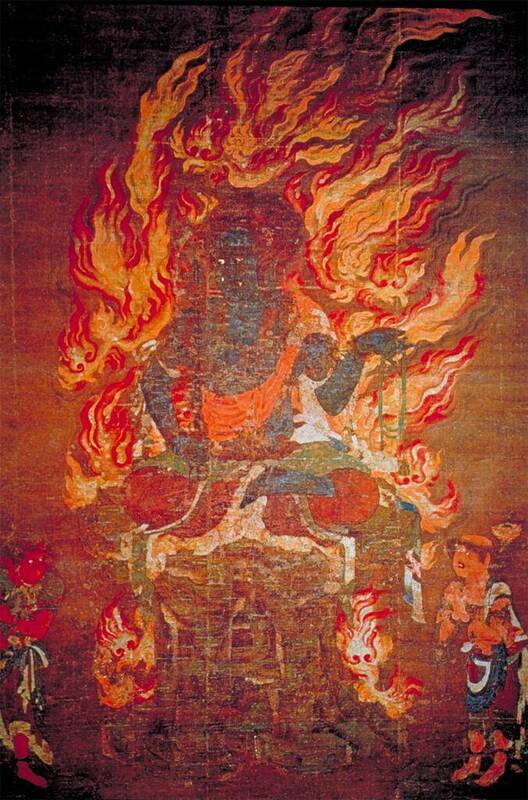 For instance, an 11th-century wall mural of the Bodhisattva Vajrapani (Jingang shou pusa, 金剛手菩薩) in Kashmir features five colored Garudas flying about his flaming halo (fig. 18). Beer explains that these represent the five Buddhas or Buddhist families of Esoteric Buddhism. He adds: “a yellow garuda stands for earth, a white for water, a red for fire, a black for air, and a blue or multicoloured for space” (Beer, 1999, p. 62). This variation changed as it rapidly spread into China. 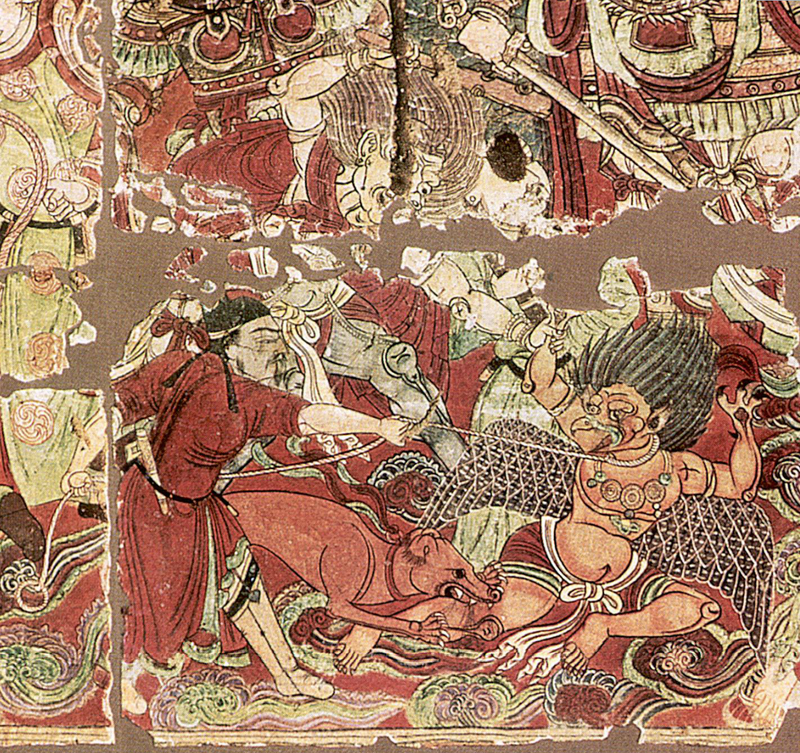 An 11th-century painting from the famous Mogao caves of Dunhuang depicts the Bodhisattva Hayagriva (Matou Guanyin, 馬頭觀音), the “Horse-Headed Guanyin,” with three (of five?) fiery Garudas comprising his halo (Fig. 19). This “Garuda aureola” reached its zenith in Japan. One beautiful 11th-century example shows the Esoteric Buddhist guardian deity Fudō Myōō (Budong mingwang, 不動明王) set against a Garuda halo. The five Garudas are portrayed as flaming roosters encircling the god (fig. 20) (Akiyama, 1961, pp. 53 and 57). Thus, Esoteric Buddhism was the catalyst for the spread of the Garuda aureola motif towards the east. Fig. 18 – Five colored Garudas in the aureola of the the Lha khang Soma Vajrapani (11th-cent. ), Kashmir (larger version). Photo by HABRA. Fig. 19 – Hayagriva with flaming Garudas (11th-cent. ), Dunhuang, Gansu, China (larver version). The simplistic Garudas are located to the respective left and right of a Face of Glory, as well as in between his legs. Photo by the Musée national des Arts asiatiques. Fig. 20 – The God Fudo-myoo (Acala) and Two Attendants (11th-cent. ), Japan (larger version). Photo by the University of California, San Diego. The Mongol rulers of the Yuan Dynasty (1271–1368) were largely responsible for bringing the Garuda and serpents motif to China. They were ardent followers of Tibetan Buddhism, and so they invited Buddhist lamas to preach in the Middle Kingdom. The person who first introduced Tibetan Buddhist art to China was the Nepalese artist Anige (阿尼哥, 1245–1306). At the surprisingly young age of eighteen or nineteen years old, he arrived at the Mongol court in 1260 as the leader of twenty-four artisans. His most famous accomplishment is the White Pagoda of the Miaoying temple in Beijing (Stoddard, 2008, pp. 19-20). Anige is the father of a Tibetan Stylistic tradition that carried on long after his death. For instance, the Mongols commissioned several stupa-arches to be constructed “on strategic roads leading to the capital [of Beijing]” (Stoddard, 2008, p. 23). The only surviving example is the cloud platform of Juyong Pass (Juyong guan, 居庸關), a later addition to the Great Wall of China built in 1354. It originally supported three Buddhist stupas, but these disappeared within a century of their completion. Multilingual inscriptions on the arch indicate that it was built “in order to bring happiness to the people who pass under the stupa and receive thus the Buddha’s blessings” (Stoddard, 2008, p. 23). 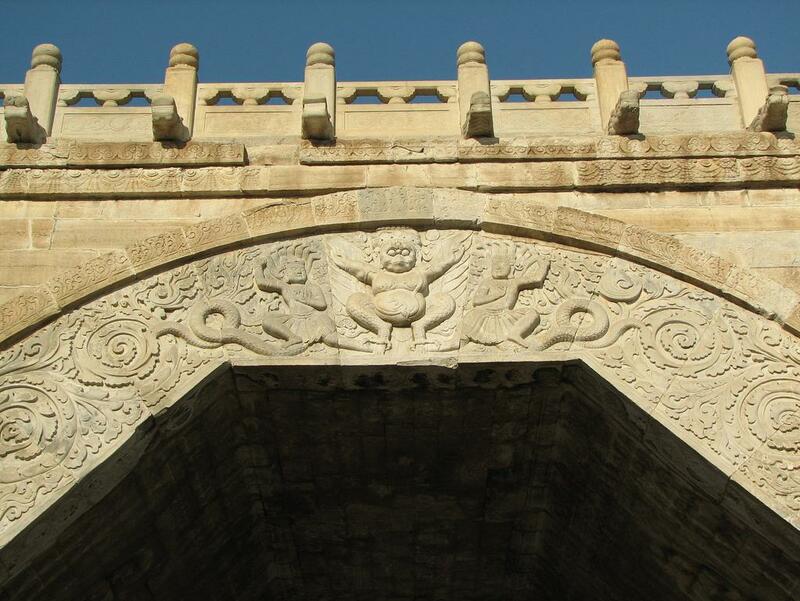 The apex of the arch contains the Garuda and serpents motif (fig. 21 and 22). The man-bird is depicted as a stout, pot-bellied figure with the face, wings, and talons of a raptor bird and the ears, arms, and torso of a human. He wears a jeweled crown and his body is decorated with serpents on his wrists, arms, and chest. Hierarchy in scale is employed to portray the humanoid naga-spirits as smaller in stature and importance. They are trying to run away from him, but their scaly heels are pierced by his talons. Fig. 21 – The Gate of Glory from the Cloud Platform of Juyong Pass (1345), Beijing, China (larger version). Photo by Snuffy on Flicker. Fig. 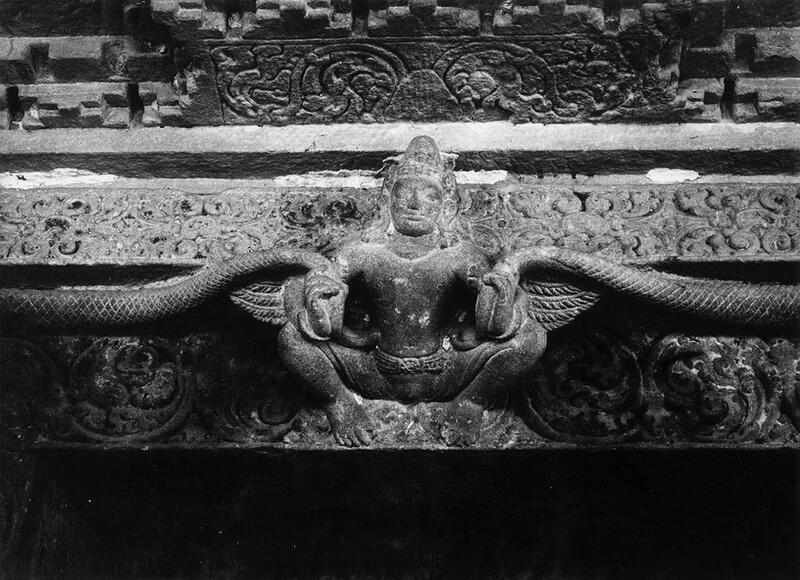 22 – A detail of the Garuda and serpents motif (photographer unknown) (larger version). The motif continued to appear in Buddhist art into the Ming dynasty (1368–1644) after the Chinese had overthrown the Mongols. This is because some Chinese rulers, such as the Yongle Emperor (永樂帝, r. 1402–1424), upheld the Tibetan Buddhist tradition. Ming examples include a painting in the Sotheby’s collection dated to the 15th-century (fig. 23 and 24); a relief carving on a 15th-century pagoda at Zhenjue Temple (真覺寺) in Beijing (fig. 25 and 26); and a stone stele in the Freer Art Gallery collection dated to circa 1500 (fig. 27 and 28). All of these pieces depict a Buddhist deity sitting before an enlightenment torana lorded over by Garuda and his serpentine foes. 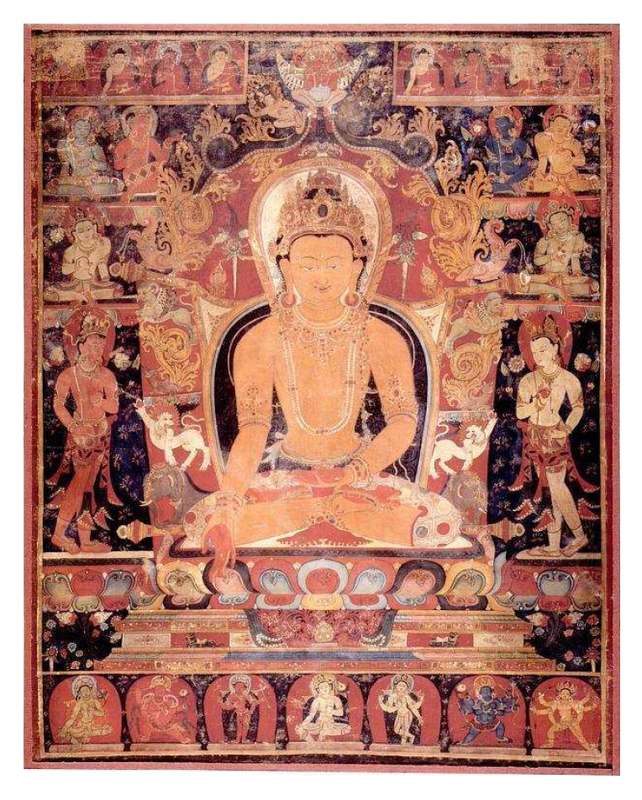 What’s important here is that the variety of media suggests the motif became a standardized element of Sino-Tibetan Buddhist art at least a century prior to the publishing of Journey to the West (1592). The commonplace nature of the motif might then explain why it was included in the story. There are numerous occasions in the novel when the author/compiler provides folk origins for everyday concepts, such as why rings are put through the noses of buffalos. So a bird attacking serpents above the head of the Buddha would certainly need a fanciful genesis story. Fig. 23 – The Amitabha Buddha with an enlightenment torana (15th-cent.) (larger version). Fig. 24 – A detail of the Garuda and serpents motif (larger version). Photos by Sotheby’s. Fig. 25 – Zhenjue Temple relief carving (15th-cent. ), Beijing, China (larger version). Fig. 26 – A detail of Garuda (larger version). Photos by Wikimedia commons. Fig. 27 – A stone stele of a Bodhisattva with an enlightenment torana (c. 1500) (larger version). Fig. 28 – A detail of the motif (larger version). Photos by the Freer Gallery of Art. Artistic renderings of Sire Thunder after his metamorphosis are strikingly similar to Garuda. A prime example of this comes to us in the form of a 9th-century fresco from Xinjiang originally held in the Berlin Museum of Indian art. 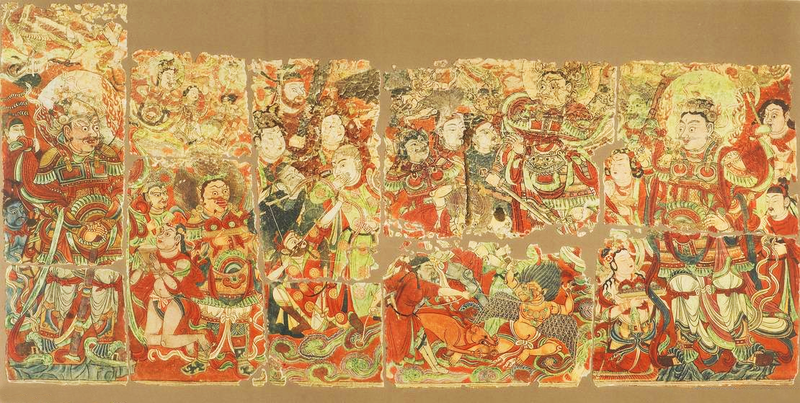 The piece depicts numerous beings paying homage to the Four Heavenly Kings (Sida tianwang, 四大天王) (fig. 29). The foreground depicts Sire Thunder caught in a hunter’s snare around his neck, while a hound bites at his leg. A larger figure, presumably a guardian deity of sorts, holds one of the god’s wrists and stands with a club held overhead ready to strike (fig. 30). This scene contrasts with the overall religious nature of the piece, giving the impression that this “demon” is being captured in the name of the heavenly kings. So here we have a bird monster being subjugated by Buddhist forces. Such art could have easily influenced Garuda’s depiction in Journey to the West. Fig. 29 – A fresco showing the adoration of the Heavenly Kings (9th-cent. ), Xinjiang, China (larger version). Fig. 30 – A detail of the subjugation of Sire Thunder (larger version). A literary motif appearing in Journey to the West (1592) and The Story of Yue Fei (1684) depicts the Hindu-Buddhist bird deity Garuda as a demon-turned-Buddhist guardian who sits above the Buddha’s throne. This is based on the bird’s portrayal in the ancient Indian epic the Mahabharata (4th-century BCE), where he comes to sit above the deva Vishnu after taking part in a filial quest and agreeing to carry the god’s celestial vehicle (vimana). Beginning around the 2nd-century BCE, Garuda started appearing on Hindu and Buddhist architecture that depicted him on ritual flag poles and above torana doorways. A motif of Garuda gasping the tails of naga-serpents, his eternal foes from Hindu lore, appeared by at least the 7th-century and spread as far away as Cambodia by the 9th– or 10th-century. The motif was adopted by Tibetan Buddhist artists by the 11th-century and incorporated into wall murals, thus making the jump from architecture to paint. It never lost its association with architecture, however, since the torana came to be equated with the halo of Buddhist deities. This “enlightenment torana” or “gate of glory” became a common feature of Tibetan Buddhist art and even made its way to Japan. 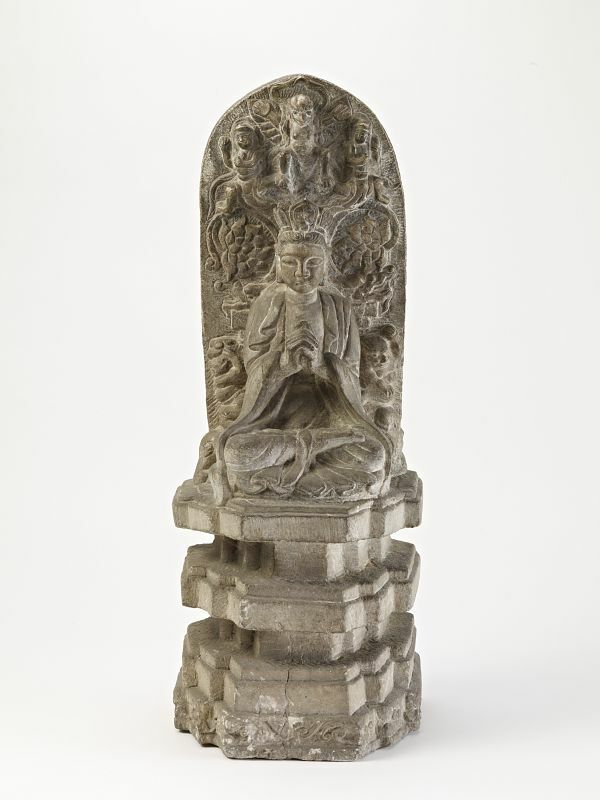 This feature was depicted as the backrest of a throne, hence the Chinese literary motif of Garuda sitting above the Buddha can be directly tied to this style of art. The Mongols were largely responsible for bringing the motif to China as they were adherents of Tibetan Buddhism. It continued into the Ming dynasty thanks to royal patronage of Esoteric Buddhism. The motif appeared in Ming religious architecture, paintings, and stele, making it commonplace enough for the author/compiler of Journey to the West to provide a folkloric explanation for the phenomenon. 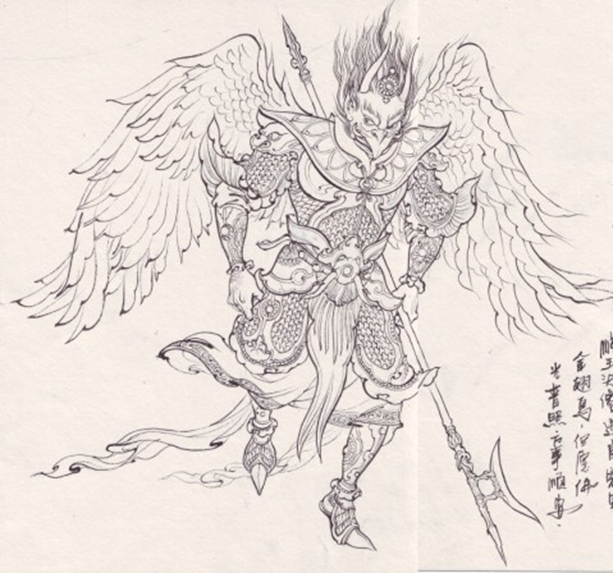 But the concept of a demonic bird being subjugated is most likely based on the Tang Dynasty Thunder Ritual and stories of Sire Thunder, a Daoist weather deity with bird-like features, being captured by mortals and compelled to use his powers in their service. Sire Thunder’s avian form has persisted to this day, having become his standard iconography. Here I present a late 19th to early 20th-century wooden altar statue depicting the deity with his counterpart the Mother of Lightening (Dianmu, 電母) (fig. 31). His similarities to Garuda are just as noticeable today. Fig. 31 – Sire Thunder and the Mother of Lightning (19th to 20th-cent. ), Taipei, Taiwan (larger version). In the author’s personal collection. Becoming rather agitated, the Daoist loosened his hair, picked up his sword, and recited another spell as he burned a charm. Once more he brought down his tablet with a bang, and immediately the Heavenly Lord Deng arrived from the South Heaven Gate, trailed by the Squire of Thunder and the Mother of Lightning. When they saw Pilgrim [Sun Wukong] in midair, they saluted him, and he gave his explanation as before. “What powerful summons,” he said “brought you all here so quickly?” The Heavenly Lord said, “The proper magic of Five Thunder [Wulei fa, 五雷法] exercised by that Daoist was not faked. He issued the summons and burned the document, which alerted the Jade Emperor. The Jade Emperor sent his decree to the residence of the Primordial Celestial Worthy of All-Pervading Thunderclap in the Ninefold Heaven. We in turn received his command to come here and assist with the rainmaking by providing thunder and lightning.” “In that case,” said Pilgrim, “just wait a moment. You can help old Monkey instead.” There was, therefore, neither the sound of thunder nor the flash of lightning (Wu & Yu, 2012, vol. 2, p. 293). The techniques used by the animal spirit for calling rain refers back to the aforementioned Thunder Ritual, where the powers of Sire Thunder are used in the service of another. 1) This name is a reference to the mythical Peng (鵬) bird mentioned in the first chapter of the Zhuangzi (莊子), a philosophical work of the 3rd-century BCE. The chapter details how the creature starts life as a small Kun (鯤) fish and changes into a bird of unfathomable size with wings that span the sky (Zhuangzi & Watson, 2003, pp. 23-24). 2) See Wu & Yu (2012) chapters 74 to 77. 3) The sources are actually conflicting on which relief is older. For instance, Iyer (1977) claims the first is the “earliest representation of garuda” (p. 52). On the contrary, Dhar (2009) lists the second as being from “c. second-first century BCE” (p. 10), which would make it older than the Sanchi example. I, however, believe the second is younger than the first because it is clearly an embellished version of the first. 4) Although some of its iconographical elements can be similar to the bird god, the Face of Glory shouldn’t be confused with Garuda because it represents the “monster of greed” (Beer, 1999, pp. 69-70). This is why it is constantly in the act of eating. 5) This recalls the story of Krishna defeating the serpent Kaliya by dancing on his head (Leeming, 2006, p. 232). 6) For example, in chapters 50 to 52, Laozi’s buffalo runs amuck on earth as a demon. The monster uses a diamond bracelet that he stole from his master to capture Monkey’s staff. The simian hero enlists the aid of the Daoist patriarch, who subjugates the beast and later puts the bracelet through its nose and uses a sash as a lead. The novel then explains: “Thus the custom of leading the buffalo with a ring in its nose was established, a custom in use even now” (Wu & Yu, 2012, vol. 3, p. 30). 7) People struck by lightning were thought to have been marked (scarred) with a sign of their guilt much like a convict in ancient China was tattooed (Meulenbeld, 2007). 8) See Meulenbeld (2007) chapter 4. See also section 6.4 for a discussion on Sun Wukong and his relationship to Sire Thunder and the Thunder Ritual. Akiyama, T. (1961). Japanese painting. [Geneva]: Skira; [distributed by World Pub. Co., Cleveland. Association for Asian Studies., Goodrich, L. C., & Fang, Z. (1976). Dictionary of Ming biography, 1368-1644. New York: Columbia University Press. Beer, R. (1999). The encyclopedia of Tibetan symbols and motifs. Boston: Shambala. Dallapicolla, A. L. (2002). Dictionary of Hindu lore and legend. New York: Thames & Hudson. Dehejia, Vidya. 1997. Indian art. London: Phaidon. Dhar, P. P. (2009). The Toraṇa in Indian and Southeast Asian architecture. New Delhi: D.K. Printworld. Elgood, H. (2000). Hinduism and the religious arts. London: Cassell. Ganguli, K. M., and Rāya, P. (2003). The Mahabharata of Krishna-Dwaipayana Vyasa. New Delhi: Munshiram Manoharlal Publishers. Gupte, R. S. (1967). The art and architecture of Aihole: A study of early Chalukyan art through temple architecture and sculpture. Bombay: Taraporevala. Hsia, C. T. (2004). C. T. Hsia on Chinese Literature. New York: Columbia University Press. Iyer, K. B. (1977). 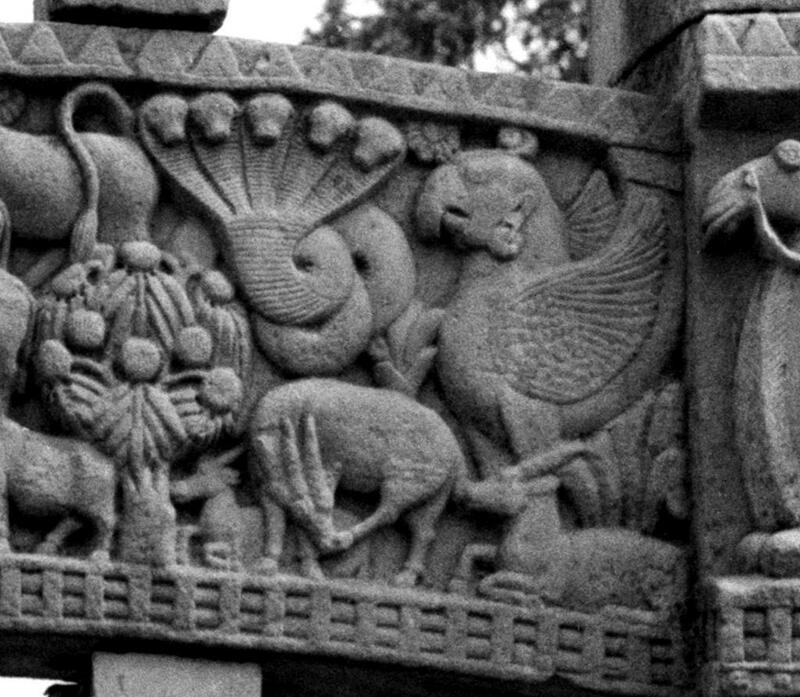 Animals in Indian sculpture. Bombay: Taraporevala. Kramrisch, S. (1928). The Vishnudharmottara (part III): A treatise on Indian painting and image-making. Calcutta: Calcutta University Press. Leeming, D. A. (2006). The Oxford companion to world mythology. Oxford: Oxford Univ. Press. Malandra, G. H. (1993). Unfolding a maṇḍala: the Buddhist cave temples at Ellora. Albany, NY: State Univ. of New York Press. Meulenbeld, M. R. E. (2007). Civilized demons: Ming thunder gods from ritual to literature (Doctoral dissertation). Available from ProQuest Dissertations and Theses database (UMI No: 3247802). Mookerji, R. (1973). The Gupta Empire. Delhi: Motilal Banarsidass. Patel, S. K. (1992). Hinduism in India: A study of Viṣṇu worship. Delhi (India): Amar Prakashan. Qian, C. (2016). Shuo yue quan chuan. Zhangsha: Yue lu shu she. Qureshi, D. (2010). The rock-cut temples of Western India. Delhi, India: Bharatiya Kala Prakashan. Singer, J. C. (1999). 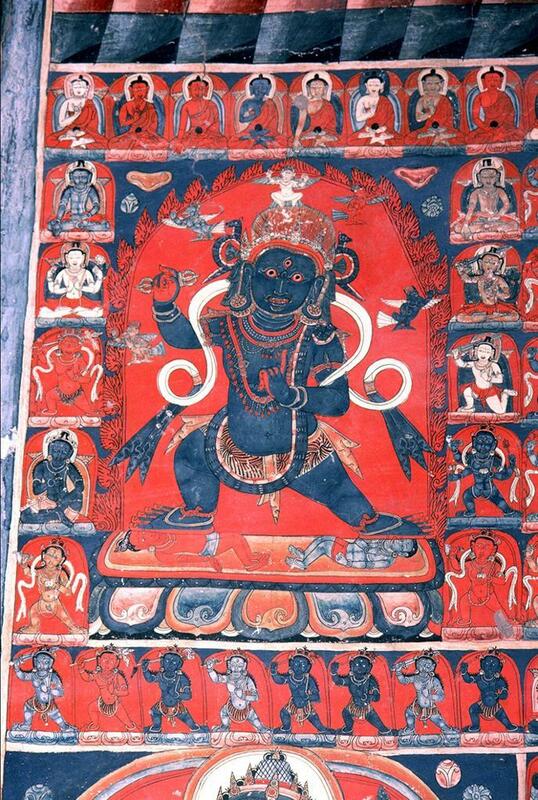 The cultural roots of early Central Tibetan painting In Kossak, Steven M., and Jane Casey Singer. 1999. Sacred visions: early paintings from Central Tibet (pp. 3-24). New York: Metropolitan Museum of Art. Smith, V. A. (1969). The Jain stûpa and other antiquities of Mathurâ. Varanasi: Indological Book House. Stoddard, H. (1996). Early Tibetan Paintings: Sources and Styles (Eleventh-Fourteenth Centuries A.D.). Archives of Asian Art 49, pp. 26-50. Stoddard, H. (2008). Early Sino-Tibetan art. Bangkok: Orchid Press. Tartakov, G. M. (1997). The Durga temple at Aihole: a historiographical study. Delhi [u.a. ]: Oxford University Press. Vogel, J. P. (1972). Indian serpent-lore: or, the Nāgas in Hindu legend and art. Varanasi [India]: Indological Book House. Walker, B. (1968). Hindu world: an encyclopedic survey of Hinduism. London: Allen & Unwin. Wu, C., & Yu, A. C. (2012). The journey to the west: volumes 1-4.. Chicago: University of Chicago Press. Zhuangzi, & Watson, B. (2003). Zhuangzi: Basic writings. New York: Columbia University Press. Zimmer, H. R., & Campbell, J. (1946). Myths and symbols in Indian art and civilization. [New York]: Pantheon Books. Sun Wukong’s Greatest Feat of Strength: An Allegory for Cultural or Religious Conflict? A Historical Source for Monkey’s Staff?